I love to hear of paradigm shifts that alter our perception of the natural world, like the discovery of oxygen, given the fact that it was, and is, all around us and necessary for aerobic life, but until that point we were oblivious. It reminds me of a recent seminar I attended, and amazingly managed to stay awake for the duration (suffering seminar-colepsy as I do); in it the chap was discussing the types of folds found in the structures of proteins that comprise the capsid (skin, for want of a better descriptor) of specialised viruses that infect bacteria, so called bacteriophages. Now, bacteriophages are the most abundant life-form/biological entity on the planet, and probably the most diverse too, thus when pointing out that one particular fold had never previously been observed before, he was quick to follow that this previously unknown fold also happens to be one of the most common folds in nature. We will return to the scheduled programme after these quick messages. With an interest in the strange and bizarre I will often write about some of the odder phenomenons observed in nature. Best done in a short newsflash, or ‘advert for popular science’. In just such a change of tone, I found a paper describing the peeing habits of a species of Bamboo Ants, Cataulacus muticus. These Ants have two curious social behavioural strategies for dealing with flooding of their nests. During the heavy rains, the workers form a living umbrella over their nest entrance using their packed heads. Of course, rainwater may still seep in, so not being ones to shirk responsibility, the Ants respond by drinking the water, exiting the nest and excreting the water droplets down the outer stem surface. It’s called communal-peeing, what else? 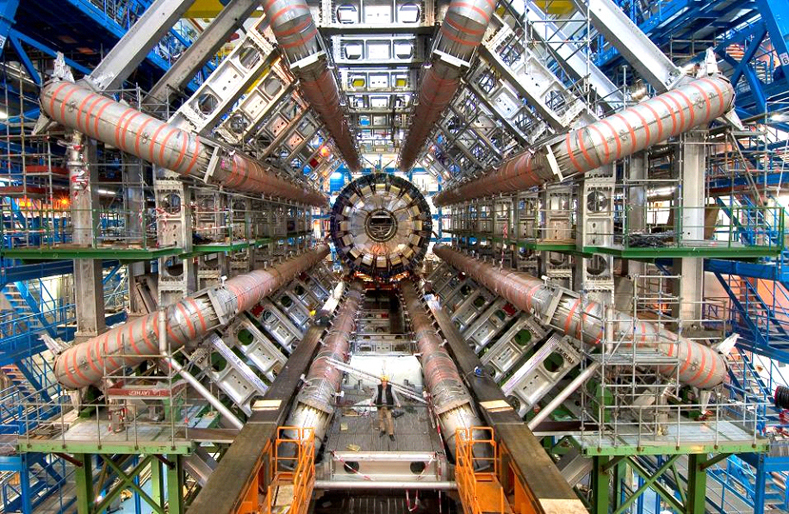 By September last year, we had the imminent switch-on of the Large Hadron Collider, and the erroneous doom-saying of some members of the press (and some scientists). I suggested that there comes a point when you really must accept the advice of experts, because you can’t expect to be an expert on everything about which you hold an opinion, this would be an unreasonable and untenable position. You trust that a cardiac surgeon knows how to perform your quadruple by-pass surgery; you trust that aeronautic engineers have really created an aeroplane that will fly; and you trust that if you buy a phone, you are in fact going to be able to call someone with it. We all know that people are generally terrible at assessing risk, and that we will invariably migrate towards what we think is the seemingly safe alternative, only to be told that we’ve taken the riskier path in our ignorance. I guess in simpler times such an approach worked, to a greater than lesser extent, after all we’re still here; it may have just amounted to, ‘Watch that Lion!’, ‘What Lion?’, *SPLAT*. Times are a little more complicated, thus we have science; what we can say of science, and the approach to it, is that it permits a us to have, with the highest degree of certainty possible, a reliable knowledge of nature. The one where Jim realises that this blog will be so long it’ll scare everyone away, so decides to cut it short. There are many different flavours of articles in any science blog, mine included. There are those blog articles that will discuss/critique/make-accessible some scientific discovery, usually backed up by the article itself; these are often rich and informative blogs, especially ‘research blogging‘, of which I am a fan. There are those blog articles that describe a generally interesting find, or ‘science titbit’. These are good fodder for a quick read, and great if you haven’t got a lot of time on your hands, though even these can garner some interest, as I received with ‘The strength of great apes‘, describing the folly of engaging in an arm-wrestle with a Chimpanzee in the pub. Because scientists are only human, there is inevitably some personal blogging. After all, you’ve spent all this time building a readership and designing a readable and attractive site, so when you have good news, terrible news or something else you’d like to show off, it finds its way onto your blog. I particularly enjoy this in science blogs, it gives some personality to go with the science. The same but different – a blessay about epigenetics; how identical sequences of DNA can result in different biology. The perils of positivity – the overly ‘positive’ nature of results, lamenting how we are doomed to make the same mistakes in the lab time after time, because noone writes up things that don’t work. “Two plus two makes five’, Winston Smith, 1984 – a rant about one of my favourite topics, evolution, emphasising that there is no scientific controversy about evolution. Attention to detail, A dichotomy of research, Dressing up biology like a circuit board, Life in Dr Jim’s lab (part 1), The pain of science – all tales from the bench of a jobbing scientist. Hox box – an essay about hox genes and why our head is where it is, why we have two arms joined to our upper body and not to our hips, and why we have feet, rather than hands, at the ends of our legs. Basic research – the peril of not funding fundamental scientific research. Bio-suit – how human do you think you are? An essay about the human microbiome – the zoo of organisms that live on us, and in us – without which we wouldn’t be here. In preparation – an essay that never was; things I wanted to blessay, but didn’t have the time as I was off for jollies in Australia. I guess all this tells me is that I like to write about a bit of everything, a jack of all writings and master of none? Whilst I by no means limit myself to any particular area of science, the main thing that concerns me is a lack of voice. There is a huge body of bloggers out there and I have always struggled to find a particualr niche into which I can slot myself. This continues to be my quest, and it would be much helped if I wasn’t stuck at the bench 24/7.